Periodic Table Map is an interactive way to explore the chemical elements. Use the table like it's a map. Drag to move around and zoom by pressing elements or using the controls on the right of the screen. As you zoom in, more information and media are revealed. A set of filters also lets you refine what elements are displayed; by name, year discovered, state of matter at any given temperature and category. Read more about why and how Periodic Table Map was made. Vial of glowing ultra pure hydrogen, H2. Although hydrogen was prepared many years earlier, it was first recognized as a substance distinct from other flammable gases in 1766 by Henry Cavendish, who is credited with its discovery; it was named by Antoine Lavoisier in 1783. Vial of glowing ultra pure Helium. A French astronomer, Pierre-Jules-César Janssen, first discovered helium during the solar eclipse of 1868 in India when he detected a yellow line (587.49 nm) in the solar spectrum very close to the yellow sodium D-line. For many years helium was regarded as an element that might exist on the sun although it was unknown on the Earth. Lithium was discovered by Johan August Arfvedson in 1817 during an analysis of petalite ore, an ore now recognised to be LiAl(Si2O5)2, taken from the Swedish island of Utö. Arfvedson subsequently discovered lithium in the minerals spodumene and lepidolite. C.G. Gmelin observed in 1818 that lithium salts colour flames bright red. Pure beryllium bead, 2.5 grams. 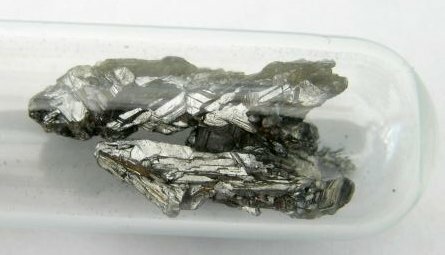 Polycrystalline chunks of rhombohedral β-boron, net 25.5 grams. Diamond and graphite shown side by side. Spectrum = gas discharge tube filled with nitrogen N2. Used with 1,8kV, 18mA, 35kHz. ≈8" length. It was known during the 18th century that air contains at least two gases, one of which is oxygen which supports combustion and life, and the other was nitrogen which does not. Nitrogen was discovered by Daniel Rutherford in 1772, who called it noxious air. Spectrum = gas discharge tube filled with oxygen O2. Used with 1,8kV, 18mA, 35kHz. ≈8" length. Leonardo da Vinci suggested that air consists of at least two different gases and of these one of the gas supported flames and life. Oxygen was prepared by several workers before 1772 but these workers did not recognize it as an element. Joseph Priestley is generally credited with its discovery (who made oxygen by heating lead or mercury oxides). A tube with liquid fluorine in a cryogenic bath. In 1670 a recipe containing calcium fluoride, CaF2 was used to etch glass. It seems that George Gore made a little fluorine through an electrolytic process but his apparatus exploded when the fluorine produced reacted with hydrogen from the other electrode. The element finally was isolated in 1886 by Ferdinand Frederic Henri Moisson. Spectrum = gas discharge tube: the noble gas: neon Ne. Used with 1,8kV, 18mA, 35kHz. ≈8" length. Until the 18th century no distinction was made between potassium and sodium. Sodium was first isolated in 1807 by Sir Humphry Davy, who made it by the electrolysis of very dry molten sodium hydroxide, NaOH. Sodium was collected at the cathode. Shortly after Gay-Lussac isolated sodium by reducing caustic soda with iron metal at high temperatures. In 1808, Sir Humphry Davy discovered magnesium in its oxide, although it is not certain that he isolated the metal. Pure magnesium was isolated substantially by Antoine Bussy in 1828 by chemical reduction of the chloride. Magnesium was first isolated electrolytically by Michael Faraday in 1833. Chunk of aluminium, 2.6 grams, 1 x 2 cm. The ancient Greeks and Romans used alum in medicine as an astringent, and in dyeing processes. In 1761 de Morveau proposed the name "alumine" for the base in alum. 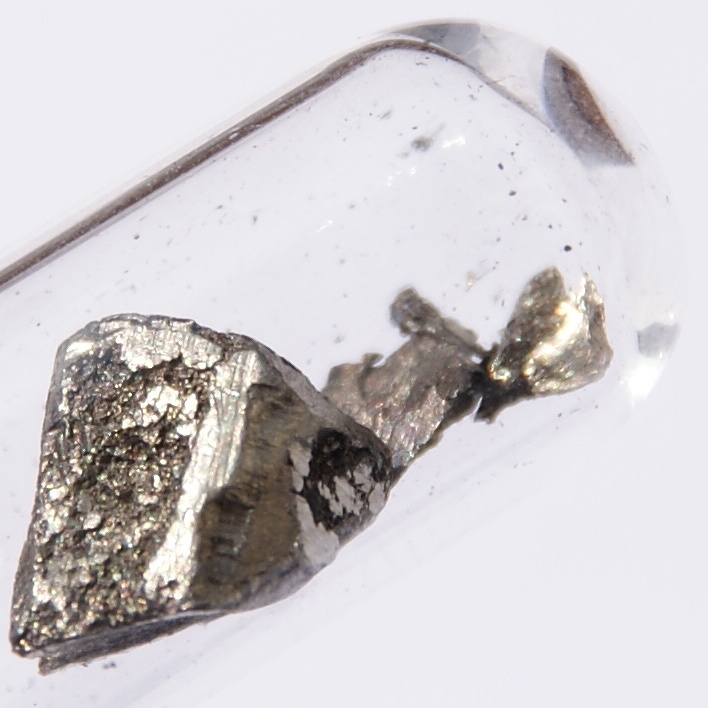 In 1807, Davy proposed the name alumium for the metal, undiscovered at that time, and later agreed to change it to aluminum. Close up photo of a piece of purified silicon. Jöns Jacob Berzelius is generally credited with the discovery of silicon in 1824. Deville prepared crystalline silicon in 1854, a second allotropic form of the element. Phosphorus was discovered in 1669 by Hennig Brand, who prepared it from urine. Not less than 50-60 buckets per experiment in fact, each of which required more than a fortnight to complete. Sulphur was known in ancient times and referred to in Genesis as brimstone. Assyrian texts dated around 700-600 BC refer to it as the "product of the riverside," where deposits could be found. In the 9th century BC, Homer mentioned "pest-averting sulphur." Chlorine gas in an ampule. Spectrum = gas discharge tube: the noble gas: argon Ar. Used with 1,8kV, 18mA, 35kHz. ≈8" length. Potassium was discovered in 1807 by Humphry Davy, who decomposed potash with an electric current. Potassium was the first metal so discovered; Davy discovered sodium a few days later by a similar experiment. Pure calcium in a protective argon atmosphere. Compounds such as lime (CaO, calcium oxide) were prepared by the Romans in the first century under the name calx. Literature dating back to about 975 AD notes that plaster of paris (calcium sulphate, CaSO4, dehydrated gypsum) is useful for setting broken bones. 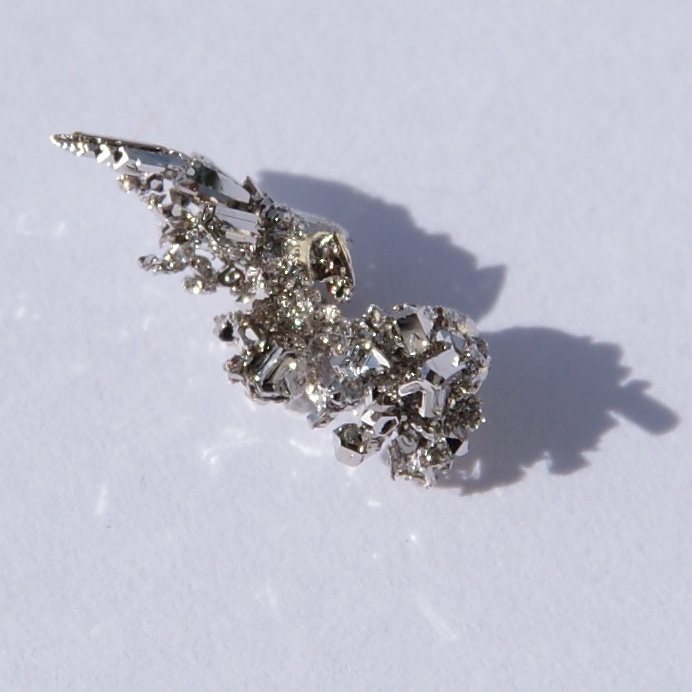 Calcium metal was not isolated until 1808. Scandium was discovered by Lars Frederick Nilson in the minerals euxenite and gadolinite, which had not yet been found anywhere except in Scandinavia. He was actually looking for rare earth metals. By processing 10 kg of euxenite and other residues of rare-earth minerals, he was able to prepare about 2 g of scandium oxide of high purity. Titanium crystal made with the van Arkel-de Boer process. 87 grams, original size in cm: 2.5 x 4. 2.3 grams pure vanadium pieces with a colored oxide layer. Size of the largest piece in cm: 0.7 x 0.7. High purity (99.999 % = 5N) chromium crystals, produced by chemical transport reaction through decomposition of chromium iodides, as well as a high purity (99,95 % = 3N5) 1 cm3 chromium cube for comparison. In the mid 18th century analysis of Siberian "red lead" (PbCrO4, crocoite) from Siberia showed that it contained quite a lot of lead, but also a further material. This was eventually identified as chromium oxide. Chromium oxide was discovered in 1797 by Louis-Nicholas Vauquelin, who prepared the metal itself in the following year. Manganese metal was isolated by Johan Gottlieb Gahn in 1774. He reduced the dioxide (MnO2, as the mineral pyrolusite) with charcoal (essentially carbon) by heating and the result was a sample of the metal manganese. Iron is an abundant element in the universe; it is found in many stars, including the sun. Iron is the fourth most abundant element in the earth's crust, of which it constitutes about 5% by weight, and is believed to be the major component of the earth's core. 3 gram piece of cobalt. A piece of Ni about 3 cm in size. Nickel was discovered in 1751 by A. F. Cronstedt in kupfernickel (niccolite), a copper-colored nickel arsenide mineral. Nickel is present in most meteorites. It is also found in trace amounts in plants and animals. Macro of native copper about 1 ½ inches (4 cm) in size. Copper and some of its alloys have been used by humanity since the Bronze Age. One of the first metals known to humans, free copper was probably mined in the Tigris-Euphrates valley as long ago as the 5th cent. B.C. Cyprus, from which the metal's name originally comes, was the primary source of copper in the ancient world. Zinc, purity 99.995 %, left: a crystaline fragment of an ingot, right: sublimed-dendritic, and a 1 cm3 zinc cube for comparison. Ultra pure chunk of polycrystalline germanium, 12 grams. Original size in cm: 2 x 3. Germanium was an element whose existence was predicted by Mendeleev. He predicted that the then unknown element germanium should resemble silicon in its properties. His predictions for the properties of germanium are remarkably close to the reality. Germanium was discovered in a mineral called argyrodite by Clemens Alexander Winkler in 1886. Arsenic compounds were mined by the early Chinese, Greek and Egyptian civilisations. No doubt they discovered its toxic properties early on. It is believed that Albertus Magnus obtained the element in 1250 A.D. who obtained it by heating soap together with orpiment (arsenic trisulphide, As2S3). Black, amorphous selenium, 3 - 4 grams. Original size in cm: 2. Selenium (Gr. Selen, moon) was discovered by Jöns Jacob Berzelius in 1817. He reported that tellurium was present in sulphuric acid from a Swedish factory, but in the following year decided that the impurity was not tellurium but another closely related element that he subsequently identified as selenium. Bromine was discovered independently by two chemists, Carl Jacob Löwig and Antoine Jérôme Balard, in 1825 and 1826, respectively. Bromine was not prepared in quantity until 1860 but compounds of bromine were of some considerable importance well before it was recognised as an element. Long ago an excretion from a particular kind of mussel was used to make a purple dye called "Tyrian purple." It is now known that a key compound in this process is an organobromine compund. Spectrum = gas discharge tube: the noble gas: krypton Kr. Used with 1,8kV, 18mA, 35kHz. ≈8" length. Krypton was discovered in 1898 by Sir William Ramsay and his student Morris Travers in the residue left after liquid air had nearly boiled away. Krypton was left in the residue after boiling away water, oxygen, nitrogen, helium, and argon from the sample of air. Krypton is present in the air at about 1 ppm. Strontium as synthetic crystals, sealed under argon in a glass ampoule, purity (99.95 %). Size of the image ca. 3cm * 4,7cm. Adair Crawford in 1790 recognized a new mineral (strontianite) in samples of witherite (barium carbonate, BaCO3) from Scotland. It was some time before it was recognized that strontianite contained a new element. The element itself was not isolated for a number of years after this when strontium metal was isolated by Davy by electrolysis. Ultra pure yttrium crystal. Original size in cm: 2 x 3. Yttria (yttrium oxide, Y2O3), was discovered by Johann Gadolin in 1794 in a mineral called gadolinite from Ytterby, a town in Finland. Friedrich Wohler obtained the impure element in 1828 by reduction of the anhydrous chloride (YCl3) with potassium. Purest zirconium 99.97%, two samples of crystal bar showing different surface textures, made by crystal bar process, as well as a highly pure (99,95 % = 3N5) 1 cm3 zirconium cube for comparison. The metal piece-photo was taken on a white glass plate. The name zircon probably originated from the arabic "zargun," which describes the colour of the gemstone now known as zircon. Zirconium was discovered by Martin Heinrich Klaproth at 1789 in Berlin, Germany. The minerals jargon, hyacinth, and jacinth also contain zircon and these have been known since biblical times and are mentioned in the bible. Niobium bead, slightly oxidized. Original size in cm: 0.6 x 0.6. Niobium was discovered in 1801 by Charles Hatchett in an ore called columbite. He was not able to isolate the free element. There was then considerable confusion concerning the distinction between niobium and tantalum as they are so closely related. This confusion was resolved by Heinrich Rose, who named niobium. Pure molybdenum crystal, about 20 grams. Original size in cm: 1.5 x 3. One half of a high-purity (99.99%), electron-beam-remelted ruthenium bar. Size ca. 40 × 15 × 10 mm, weight ca. 44 g.
Ruthenium was discovered in 1827 in an impure form by G. W. Osann in residues of crude platinum ores from the Ural Mts. of Russia. Pure ruthenium was first prepared by K. K. Klaus in 1845; he showed that Osann's sample contained at least one other metal. Pure rhodium bead, 1 gram. Original size in cm: 0.5. William Hyde Wollaston discovered rhodium in 1803 in crude platinum ore from South America. He dissolved the ore in aqua regia, neutralised the acid with caustic soda, and precipitated the platinum & Palladium. The left material was a red material containing rhodium chloride salt from which rhodium metal was obtained by reduction with hydrogen gas. Palladium crystal, about 1 gram. Original size in cm: 0.5 x 1. William Hyde Wollaston discovered palladium in 1803-4 in crude platinum ore from South America. He dissolved the ore in aqua regia, neutralised the acid with caustic soda, and precipitated the platinum .Palladium was then removed as palladium cyanide by treatment with mercuric cyanide. The metal was produced from this cyanide by heating. Pieces of silver, 3 grams, the biggest piece is 1 cm long. Silver has been known since ancient times. It is mentioned in Genesis. Slag dumps in Asia Minor and on islands in the Aegean Sea indicate that man learned to separate silver from lead as early as 3000 B.C. Cadmium was discovered by Friedrich Stromeyer in 1817 from an impurity in some samples of zinc carbonate. He noted that these particular samples changed colour on heating, which pure zinc carbonate does not. He was persistent to follow this observation through and he eventually isolated some cadmium metal by roasting and reduction of the sulphide. Ductile indium wire with a thickness of about 3mm. Indium was discovered by Ferdinand Reich and Theodore Richter, who later isolated the metal. It was found and spectroscopically identified as a minor component in zincores. Until 1924, a gram or so constituted the world's supply of this element in isolated form. In fact, it is probably about as abundant as silver. Blob of tin. 3 x 3 cm. Antimony crystal, 2 grams, 1 cm. Antimony was recognized in compounds by the ancients and was known as a metal at the beginning of the 17th century and possibly much earlier. It seems not to be clear who first recognised antimony as an element but the French chemist Nicolas Lémery conducted much of the earlier studies on antimony chemistry. Tellurium was discovered in gold ores by Franz Joseph Muller von Reichenstein, the chief inspector of mines in Trannsylvania in 1782. However tellurium was named by M. Klaproth, who isolated it in 1798, after he continued Muller von Reichenstein's work. Iodine was discovered by Barnard Courtois in 1811. He isolated iodine from treating seaweed ash with sulphuric acid (H2SO4) while recovering sodium and potassium compounds. Spectrum = gas discharge tube: the noble gas: xenon Xe. Used with 1,8kV, 18mA, 35kHz. ≈8" length. Caesium (cesium in USA) was discovered spectroscopically by Robert Wilhelm Bunsen in 1860 in samples of mineral water from Durkheim. Their identification was based upon two bright blue lines in the spectrum. The name caesium (from the Latin "caesius" - heavenly blue) was coined for its bright blue spectroscopic lines. Pure barium in protective argon gas atmosphere. Hafnium turnings, >99.9% pure, used for evaporating onto glass as HfO2 to create multi-layer dielectric thin film optics in conjucntion with silica layers. Hafnium was thought to be present in various zirconium minerals many years prior to its discovery, in 1923, which was credited to Dirk Coster and George Charles von Hevesey. It was finally identified in zircon from Norway, by means of X-ray spectroscopic analysis. It was named in honour of the city in which the discovery was made. Single piece of tantalum, each about 1 cm in size. Niobium was discovered in by Anders Ekeberg, but many chemists thought niobium and tantalum were the same. Some felt that perhaps tantalum was an allotrope of niobium. Later, Rose, in 1844, and Marignac, in 1866, showed that niobic and tantalic acids were two different acids.The first relatively pure tantalum was produced by von Bolton in 1907. Tungsten rod with oxidized surface, 80 grams. Original size in cm: 1.3 x 3. 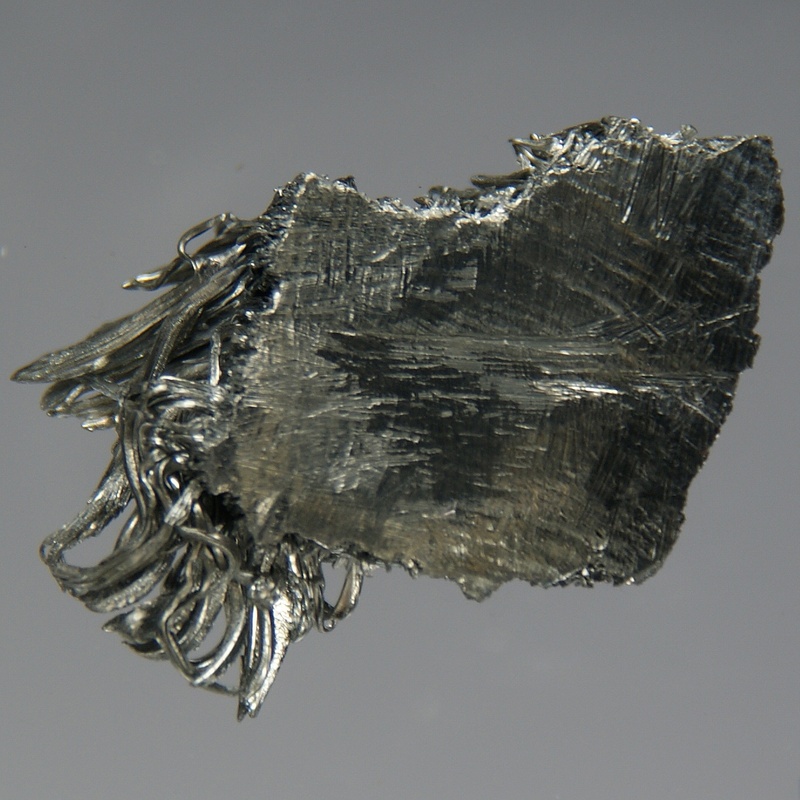 Tungsten used to be known as wolfram (from wolframite, said to be named from wolf rahm or spumi lupi, because the ore interfered with the smelting of tin and was supposed to devour the tin). The de Elhuyar brothers found an acid in wolframite in 1783 that they succeeded in reducing to the elemental metal with charcoal. Discovery of rhenium is generally attributed to Walter Noddack, Ida Tacke-Noddack, and Otto Berg), who announced in 1925 they had detected the element in platinum ores and columbite. Cluster of osmium crystals grown by chemical vapor transport. Osmium was discovered in 1803 by Smithson Tennant in the dark coloured residue left when crude platinum is dissolved by aqua regia (a mixture of hydrochloric and nitric acid). This dark residue contains both osmium (named after osme meaning odour) and iridium. Osmium was discovered in 1803 by Smithson Tennant in the dark coloured residue left when crude platinum is dissolved by aqua regia (a mixture of hydrochloric and nitric acid). This dark residue contains both osmium and iridium (named after the Latin word iris meaning rainbow because of the colourful nature of iridium compounds). Two platinum crystals, each 1 cm big, together about 1 gram. Gold has been known from prehistoric times and was possibly the first metal used by humans. It was valued for ornaments and magical efficacy was attributed to it. In the Middle Ages alchemists sought to transmute baser metals into gold. The quest for gold stimulated European explorations and conquests, and its discovery has led to many a gold rush. Mercury was known to ancient Chinese and Hindus before 2000 BC and was found in tubes in Egyptian tombs dated from 1500 BC It was used to forma amalgams of other metals around 500 BC. The Greeks used mercury in ointments and the Romans used it, unfortunately for those using it, in cosmetics. Pieces of very pure thallium in glass ampoule under argon. Thallium was discovered spectroscopically in 1861 by William Crookes. The element was named after the green spectral line, which identified the element (Greek "thallos", green twig). They had been expecting to isolate tellurium after removing selenium from the byproducts from a commercial sulphuric acid factory but instead found the new element thallium. Two pieces of lead, 11 grams, 1 x 1.5 cm each. Lead has been known for ages and is mentioned in Exodus. Alchemists believed lead to be the oldest metal and associated it with the planet Saturn. They spent a lot of time trying to "transmute" lead into gold. In early times bismuth was confused with tin and lead. So although bismuth had been discussed many times before, Claude Geoffroy the Younger showed it to be distinct from lead in 1753. Astatine was synthesized in 1940 by Dale Corson, Kenneth Ross MacKenzie and Emilio Segrèand others at the University of California, USA, by bombarding bismuth (209Bi) with alpha particles. Radon was discovered in 1900 by Friedrich Ernst Dorn, who called it niton. It is essentially inert. It has been called radon since 1923, before which it was called niton. Francium was discovered in 1939 by Marguerite Perey of the Curie Institute in Paris, (France) but its existence was predicted by Mendeleev during the 1870's. Since its properties should track those of caesium rather closely, he called it eka-caesium. In 1967, Flerov reported element 105 after experiments at the Joint Research Institute in Russia involving reactions between 243Am ions with 22Ne ions. In 1970, Ghiorso and others announced their synthesis of dubnium at Berkeley (California) in the USA. This method involved the collsion of 249Cf ions with 15N ions. Transuranium elements such as seaborgium can be created artificially in particle accelerators. Isotopes of seaborgium have short half-lives of less than a second. The first report of element 106 came in 1974 from the Soviet Joint Institute for Nuclear Research and these were followed later by others from Berkeley in California, USA. Scientists from the USSR reported their production of an isotope of bohrium in 1976 and this work was substantiated by German workers later. Hassium was discovered by Peter Armbruster, Gottfried Münzenber and their co-workers. at 1984 in Gesellschaft für Schwerionenforschung (GSI) in Darmstadt, Germany. The origin of the name is the Latin word "Hassias" meaning "Hess", the German state. In 1994 the first atom of element 110, darmstadtium, was detected at the Gesellschaft für Schwerionenforschung (GSI) in Darmstadt, Germany. The isotope discovered has an atomic number of 269 (that is, 269 times heavier than hydrogen). Element 111, roentgenium, was discovered towards the end of 1994 at the GSI in Darmstadt, Germany. Three atoms of an isotope 272Uuu were produced in reactions between 209Bi targets and 64Ni projectiles. To achieve this, the nickel atoms were accelerated to high energies by the heavy ion accelerator UNILAC at GSI and directed onto a lead target. Element 112 was discovered on 9th February 1996 at 22:37 at the GSI in Darmstadt, Germany. The identified isotope currently is the heaviest atom ever produced by man and has an atomic mass of 277, that is, 277 times heavier than hydrogen. In experiments conducted at the JINR U400 cyclotron with the Dubna gas-filled separator between July 14 and Aug. 10, 2003, atomic decay patterns were observed said to confirm the existence of element 115 and element 113. In these decay chains, element 113 is produced via the ?-decay of element 115. * Nihonium (Nh) is a provisional name. * Moscovium (Mc) is a provisional name. Results published on the 6th December 2000 concerning recent experiments at Dubna in Russia describe the decay of the isotope 292Uuh (produced in the reaction of 248Cm with 48Ca) to 292Uuq. This decayed 47 milliseconds later as follows to a previously identified isotope of elements 114, Uuq. Claims for the formation of element 117 (ununseptium, Uus) were first published in April 2010. * Tennessine (Ts) is a provisional name. Experiments conducted at Dubna in Russia at the Flerov Laboratory of Nuclear Reactions (by workers from the Joint Institute for Nuclear Research in Russia and the Lawrence Livermore National Laboratory in the USA) indicate that element 118 (ununoctium, Uuo) was produced. Not too much though, one atom in the spring of 2002 and two more in 2005. * Oganesson (Og) is a provisional name. 1.5 grams pure lanthanum. Original size in cm: 1 x 1. Carl Gustav Mosander recognized the element lanthanum in impure cerium nitrate in 1839. His extraction resulted in the oxide lanthana (La2O3). A number of other lanthanides (rare-earths) were later discovered by identification of the impurities in yttrium and cerium compounds. Cerium under argon, 1.5 grams. Original size in cm: 1 x 1. Praseodymium pieces under argon, 1.5 grams. Original size in cm: 0.5 - 1. In 1885, Carl Auer von Welsbach separated an "earth" called didymia obtained from the mineral samarskite into two earths, praseodymia and neodymia, which gave salts of different colours. The separation required the repeated fractionation of ammonium didymium nitrate. Neodymium under argon, 5 grams. Original length of the large piece in cm: 1. In 1885 von Welsbach separated didymium, an extract of cerite, into two new elemental components, neodymia and praseodymia, by repeated fractionation of ammonium didymium nitrate. While the free metal is a component of misch metal, (a pyrophoric alloy for lighter flints), the element was not isolated in relatively pure form until 1925. Sublimated samarium, 2 grams. Original size in cm: 0.8 x 1.5. Samarium was discovered spectroscopically by its sharp absorption lines in 1853 by Jean Charles Galissard de Marignac in an "earth" called didymia. The element was isolated in 1879 by Lecoq de Boisbaudran from the mineral samarskite, named in honour of a Russian mine official, Colonel Samarski, and which therefore gave samarium its name. Weakly oxidized europium, hence slightly yellowish. 1.5 grams, large piece 0.6 x 1.6 cm. The discovery of europium is generally credited to Eugène-Antole Demarçay, who separated the earth in reasonably pure form in 1901 from a material containing largely samarium. Pure europium metal was not isolated until much more recently. Ultra pure amorphous gadolinium, 12 grams. Original size in cm: 1.5 x 2. Spectroscopic lines due to gadolinium were observed by Jean Charles Galissard de Marignac in 1880 in samples of didymia and gadolinite. Gadolinia, the oxide of gadolinium, was separated by Paul-Emile Loq de Biosbaudran in 1886. The element was named for the mineral gadolinite from which this rare earth was originally obtained. Terbium was discovered by Gustav Mosander in 1843. He detected it is as an impurity in yttria which is yttrium oxide, Y2O3. Dysprosium dendrites. Original size in cm: 2 x 2. A little dysprosium oxide was identified in 1886 by Paul-Emile Lecoq de Boisbaudran as an impurity in erbia (erbium oxide), but the element itself not isolated at that time. Neither the oxide nor the metal was available in relatively pure form following the development of ion-exchange separation and metallographic reduction techniques. Holmium, 17 grams. Original size in cm: 1.5 x 2.5. Per Theodor Cleve of Sweden discovered holmium while working on erbia earth (erbium oxide). Holmium oxide (holmia) was present as an impurity in the erbia. The element is named after Cleve's native city. Pure holmia, the yellow oxide, was prepared at Homberg in 1911. In 1842 Gustav Mosander separated "yttria", found in the mineral gadolinite, into three fractions which he called yttria, erbia, and terbia. The names erbia and terbia became confused in this early period. After 1860, Mosander's terbia was known as erbia, and after 1877, the earlier known erbia became terbia. Thulium, sublimed-dendritic, high purity 99.99 % Tm/TREM. Per Theodor Cleve of Sweden discovered holmium in 1879 while working on erbia earth (erbium oxide). Thulium oxide (holmia) was present as an impurity in the erbia. The element is named after Thule, the ancient name for Scandinavia. Ytterbium, 0.5 x 1 cm. In 1878 Jean Charles Galissard de Marignac discovered a component, which he called ytterbia, in the earth then known as erbia. In 1907, Urbain separated ytterbia into two components, which he called neoytterbia and lutecia. The elements in these earths are now known as ytterbium and lutetium, respectively. Piece of lutetium, 3 grams. Original size in cm: 1 x 1. In 1907, Georges Urbain described a process by which Marignac's ytterbium (1879) could be separated into the two elements, ytterbium (neoytterbium) and lutetium. These elements were identical with "aldebaranium" and "cassiopeium", independently discovered by von Welsbach at about the same time. Actinium was discovered by Andre Debierne in 1899 and independently by F. Giesel in 1902, both of whom obtained it while working on separation techniques for rare earth oxides. Thorium was discovered by Jöns Jacob Berzelius in 1828 in a mineral given to him by the Reverend Has Morten Thrane Esmark. Protactinium is found in pitchblende and ores from DR Congo and is one of the rarest and most expensive naturally occurring elements. Protactinium was identified by Kasimir Fajans and Otto Hahn in 1913 who named the new element brevium. Martin Heinrich Klaproth recognized an unknown element in pitchblende and attempted to isolate the metal in 1789. He named the element for the planet uranus which had just been discovered. The radioactive nature of uranium was not appreciated for another 55 years when in 1896 Henri Becquerel detected its radioactivity. Neptunium 237 sphere (6 kg). Neptunium was the first synthetic transuranium element of the actinide series. It was discovered by Edwin McMillan and Philip Abelson in 1940 at Berkeley, California, USA, who bombarded uranium with neutrons produced from a cyclotron. It was the first synthetic transuranium (elements after uranium) element discovered. Plutonium, a silvery, very heavy and hard metal. Plutonium was synthesized by Seaborg, McMillan, Kennedy and Wahl in 1940 by deuteron bombardment of uranium in a cyclotron (a device used to accelerate atomic particles) at Berkeley, USA. Plutonium was the second transuranium element of the actinide series to be discovered. A small disc of Am-241 under the microscope. Americium was was identified by Seaborg and others in 1944 as the result of successive neutron capture reactions by plutonium isotopes in a nuclear reactor. Curium was identified by Seaborg and others in 1944 as a result of helium ion bombardment of the plutonium isotope 239Pu. Three years later visible amounts of the hydroxide were isolated by Werner and Perlman. In 1951, the same workers prepared curium in its elemental form for the first time. It took 250 days to make enough berkelium, shown here (in dissolved state), to synthesize element 117. Berkelium was discovered in December 1949 at Berkeley, Californi, USA, by Ghiorso and others by cyclotron bombardment of milligram amounts of americium with helium ions. Perhaps the first visible amounts of a pure berkelium compound, berkelium chloride, was produced in 1962. It weighed just 3 billionth of a gram. A very small disc of californium. Californium was produced by Ghiorso and others at the University of California, Berkeley, USA in 1950 who bombarded 242Cm with helium ions. Quartz vial (9 mm diameter) containing ~300 micrograms of Es-253 solid. The illumination produced is a result of the intense radiation from Es-253, which alpha decays (6.6 MeV, 1000 watts/g) with a half-life of 20.5 days. Fermium was identified by Ghiorso and coworkers (Berkeley, California, USA) in 1952 in the radioactive debris from a thermonuclear explosion in the Pacific. Somewhat remarkably, the fermium isotope discovered was made through the combination of 238U with 17 neutrons. Today, many isotopes are known spanning the mass range 243-258. Mendelevium, the ninth transuranium element of the actinide series to be discovered, was first identified by Seaborg and others in 1955 as a product of the bombardment of the einsteinium isotope 253Es with helium ions. The isotope produced was 256Md, which has a half-life of about 11/4 hours. A team working in Stockholm reported in 1957 an isotope whose atomic number is 102. They made this isotope by bombardment of 244Cm with 13C ions. They named the element nobelium after Alfred Nobel. Element 103, lawrencium, was discovered in 1961 by Ghiorso and others in Berkeley, California, USA, who bombarded a californium target with boron ions. They obtained perhaps two micrograms. Several lawrencium isotopes including those with masses 253, 254, 255, 256, 257, 258, 259, and 260 are known now.